Shop for Ubuntu Linux software. Your Ubuntu, your way. Customize to suit! Enjoy the simplicity of Ubuntu's stylish, intuitive interface. Fast, secure and with thousands of apps to choose from, Ubuntu gives you a clean and streamlined experience that you can really make your own. === Ubuntu 18.04, codename Bionic Beaver, is designed to work beautifully on the latest laptops, desktops and touch screen devices, it looks incredible on high resolution screens - and with touch screen enhancements and interface refinements including individual menu bars in each application window, it's now even easier to use. Get easy access to your favorite tools and applications with our lovely new launcher. You can hide and reveal it, add and remove apps and keep track of your open windows. Moving away from the MIR display server, and the decades-old X.Org display server, Wayland introduces a whole new level of performance. You can surf in safety with Ubuntu - confident that your files and data will stay protected. A built-in firewall and virus protection come as standard. Ubuntu loads quickly on any computer, but it's super-fast on newer machines. With no unnecessary programs and trial software slowing things down, booting up and opening a browser takes seconds. Unlike other operating systems that leave you staring at the screen, waiting to get online. Ubuntu Linux 16.04.5 is the previous Long Term Support release of the most popular Linux distribution targetting home users and developers. This is a great choice for those looking for a stable Linux operating system with patches available years into the future. Ubuntu Linux 16.04.2 works well on most PC hardware and laptops.If you are installing a new system, we suggest you instead use the new LTS edition, 18.04 LTS. 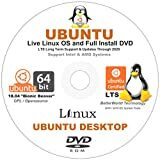 All Linux2DVD brand Ubuntu Linux 16.04.5 DVDs are created using high quality media, and have graphics directly printed on the DVD. The DVD pictured is what you will receive. Latest version of Ubuntu Linux 16.04.5. Both 32 and 64 bit operating system on one DVD. Great Linux operating system which is very powerful, but also easy enough for a beginner to use! Ubuntu 16.04.5 LTS is a long term support version of Ubuntu. You get all this for less than the cost of sales tax on many other desktop operating systems! Try Linux Mint without touching anything on your Windows Operating System or Hard Drive. Linux comes installed with a wide range of software that includes Libreoffice productivity suite, Web browser, instant messaging, image editing, multimedia and email for your everyday needs. 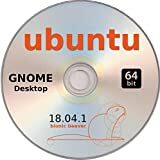 Ubuntu 18.04 LTS "Bionic Beaver" 64Bit Desktop DVD Live OS with Full Installation options. Ubuntu 18.04 LTS is the latest release of Ubuntu. Designed to work beautifully on the latest laptops, desktops and touch screen devices, it looks incredible on high resolution screens, and with touch screen enhancements and interface refinements including individual menu bars in each application window, it's now even easier to use. Ubuntu is a community developed operating system that is perfect for laptops, desktops and servers. Whether you use it at home, at school or at work Ubuntu contains all the applications you'll ever need, from word processing and email applications, to web server software and programming tools. Enjoy the simplicity of Ubuntu's stylish, intuitive interface. Fast, secure and with thousands of apps to choose from, Ubuntu gives you a clean and streamlined experience that makes it easy to do whatever you want. Perfect for business use, Ubuntu is secure, intuitive, and lightweight. Maintain access to legacy applications without paying for licenses you don't need. Ubuntu 18.04 LTS provides the largest selection of tools, the biggest community and the fastest cloud deployment. This LTS release will be supported for five years and commercial services are available from Canonical. Linux Mint 18.04 is a long term support release (LTS) which will be supported until 2028. It comes with updated software and brings refinements and many new features to make your desktop experience more comfortable to use. Ubuntu Linux 18.04 is the latest Long Term Support Edition of the most popular Linux distribution used by home users and developers. This is a great choice for those looking for a stable Linux operating system with patches available 5 years into the future. Ubuntu Linux 18.04 works well on most PC hardware and laptops, taking advantage of modern hardware but also performing quite well on slower and older hardware. 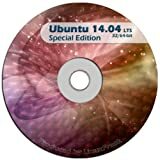 All Linux2DVD brand Ubuntu Linux 16.04.3 DVDs are created using high quality media, and have graphics directly printed on the DVD. The DVD pictured is what you will receive. All DVDs are validated prior to packing and shipment. These DVDs provide both the ability to boot the OS in Live mode (to try the OS on your hardware without actually changing your current OS), and to also install the OS once you've tried it on your hardware. It's like two disks in one! Includes BOTH the 32-bit version and the 64-bit version - on one DVD! == Ubuntu 14.04 is the latest 'Long-Term Support' Version of Ubuntu - Supported through 2017! == Ubuntu 14.04 offers some awesome new changes to the Unity interface that seriously improve and enhance the user experience. This includes changes to the look and feel of the dash and menu system, as well as a more intuitive interface. Ubuntu is smarter! The Ubuntu dash offers a great way to get to your shortcuts and search for more apps and programs. So you can get fast access to your email, music, pictures and much more. You can surf in safety with Ubuntu - confident that your files and data will stay protected. A built-in firewall and virus protection come as standard. And if a potential threat appears, we provide automatic updates which you can install in a single click. Ubuntu loads quickly on any computer, but is super-fast on newer machines. With no unnecessary programs and trial software slowing things down, booting up and opening a browser takes seconds. Unlike other operating systems that leave you staring at the screen, waiting to get online. Latest stable release of Ubuntu Linux featuring the default GNOME desktop environment. You can install Ubuntu alongside your current OS (windows) on most PCs. We only use high quality DVD media, and print graphics directly on the DVDs. What you see pictured is what you will receive. Ubuntu 18.10 is the latest version of Ubuntu Linux, featuring the GNOME desktop environment. This is the most popular Linux operating system for home use due to it's ease of use and great community support. Replace your current operating system whether it's Windows or Mac OS, or, run Ubuntu alongside it! Ubuntu 18.04 64 Bit operating system (with persistence): The #1 Linux operating system. It is very secure & fast and includes essential software already pre-installed! Easy to use (step by step booting a USB guide), customer support from Linux experts, fast shipping, high quality DVD & 16Gb USB. You'll receive a bootable 16Gb USB Flash Drive. 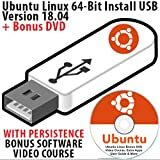 A Ubuntu Live USB gives you the opportunity to test drive Ubuntu Linux without touching your computer at all. All you'll need to do is insert the USB, boot from it and you'll be up and running Ubuntu Linux with Persistence. Ubuntu is designed to work beautifully and looks great on ANY device including touchscreen. To use Ubuntu is to fall in love with it. The desktop environment is intuitive but powerful, so you can work quickly and accomplish all you can imagine. You'll be captivated by its elegance. Secure: You can surf in safety with Ubuntu - confident that your files and data will stay protected - thanks to the built-in firewall and virus protection. Fast: Boot up and open a browser in seconds. No unnecessary programs or trial software to slow things down. Ubuntu Linux is the #1 Linux operating system and it can be ran on both Windows and Mac computers. Now you can use the same software on both PC and Mac. It's licensed under GPL so you don't need to worry about product keys or any costs. === Ubuntu 16.04 offers some awesome new updates to the Unity interface that seriously improve and enhance the user experience. This includes changes to the look and feel of the dash and menu system. Ubuntu is smarter!